A forty two hour train ride isn’t really something to be looked forward to. But after the better part of a month spent traveling further and further South, LeeAnne and I decided it was time to knock off a few of the “Must Do’s” in India – The Taj Mahal etc – so we had to find a way from Trivandrum (near the southern tip of India) to Delhi (in the North of the country). It’s a long way to go, but luckily we have time, so rather than bust the budget on a plane we took the train – and splurged for Second Class Air Conditioned Sleeping cars – well worth it. 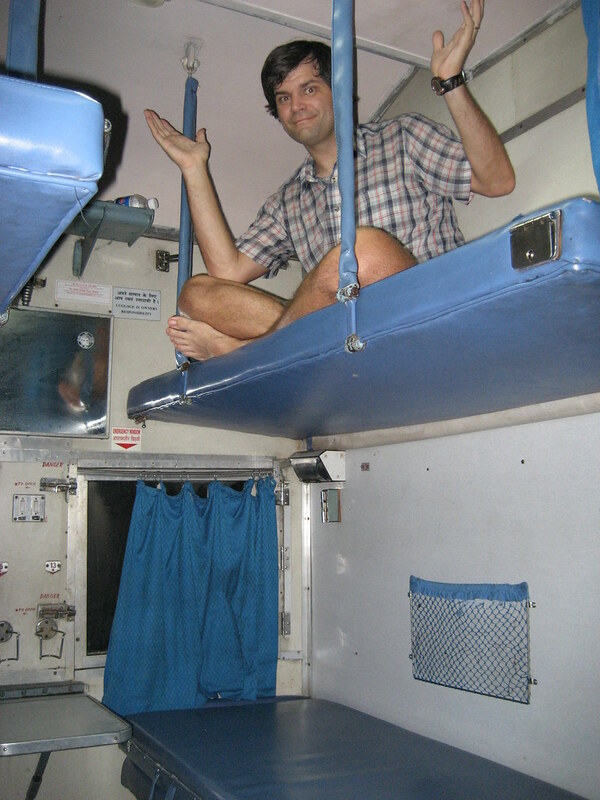 There’s a wide range of classes on Indian Railway trains. You can go First Class and have you’re own bed and bathroom, second or third class and share a berth with 3 or 5 other people, or go all seater or bench class. In most of these there is another important difference – you can choose to pay 4 times as much and go in an Air Conditioned car. The temperature in Delhi is topping out at 110 this week – we chose the AC car. The AC in our sleeper had two settings – Cold and Arctic. On the second night of our journey both LeeAnne and I found ourselves sleeping under the very thick blankets provided by the staff. So what do you do if you’re on a train for 42 hours? Read, eat and sleep. Mostly eat. Because this train is so long and there are no stop-overs all the food is provided for you. If you decide to ride the Rajdhani Express you can expect to eat about 4 full meals a day and have tea at unexpected hours. I’m sure we put on a few pounds on this train ride.